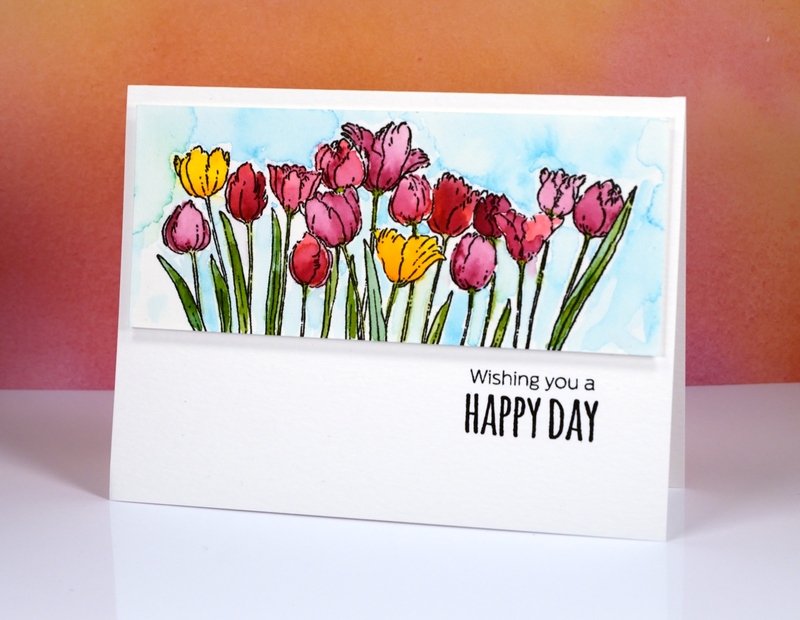 I used tulips on my first card for the challenge and here I am back again with another tulip card but the look is different. I stamped the image in versafine onyx black ink on hot pressed watercolour then used Peerless watercolour paints to fill the scene. I wasn’t overly careful to stay inside the lines or even fill the shapes. When all the tulips and leaves were dry I added some aqua paint all around then keeping the watermarks as part of the design to suggest clouds. I did a little stamp surgery to create a shorter sentiment from one of the ‘happy thoughts’ stamps. I hope you will check out the cards the design team made and also the entries in the challenge so far. 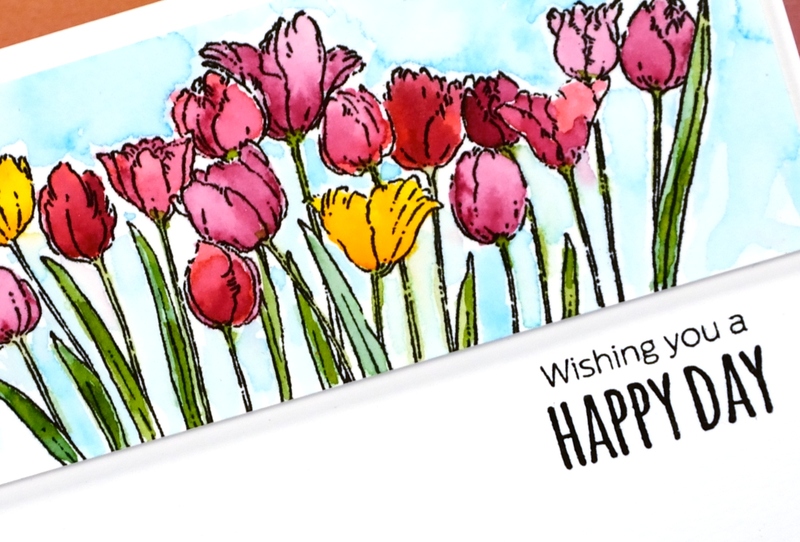 Then I know you will be so inspired you will add one of your own ‘spring’ cards. What a beautiful tulip garden, Heather! You always inspire me with your watercolors! Thanks so much for sharing your talent with us on the Design Team this month! So pretty, and very spring-like! I hope you don’t have to rely on this card by the time Tulip Festival rolls around. What a wonderful array of tulips – the perfect spring flowers! Love your colours and the layout of the card. 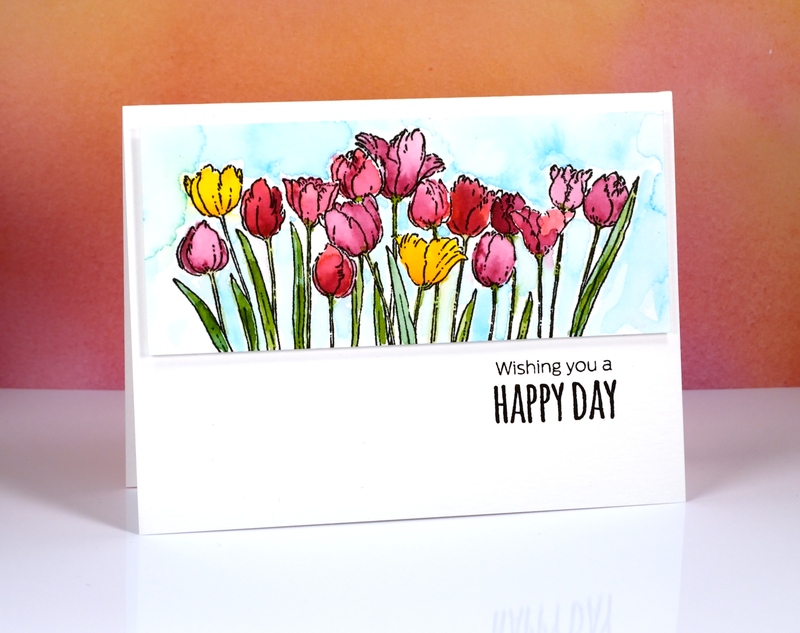 It has been a pleasure having you as our CAS Watercolour Guest Designer this month. I’ve learned so much from you over the years.